Heavy Planet is proud to be a sponsor of this year's installment of the Doom in June Festival in Las Vegas on June 1st at the Cheyenne Saloon. 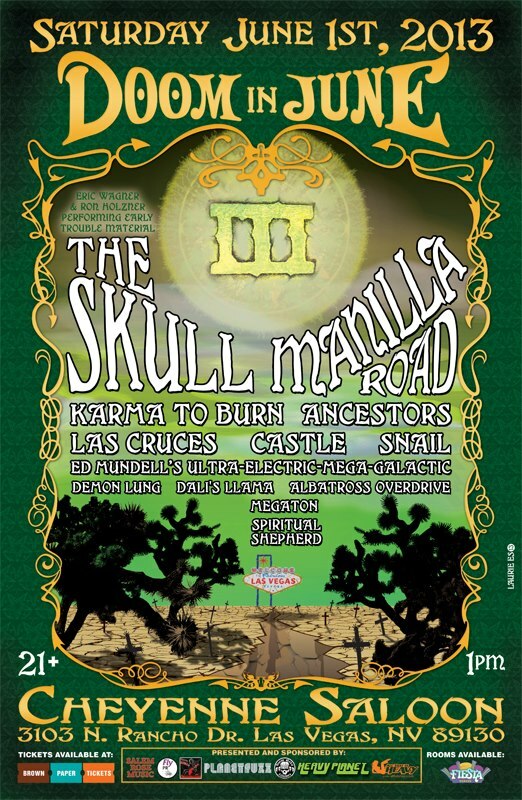 The all-day-and-night Vegas doom-metal fest returns after a year in hiatus with a strong collection of bands, including The Skull (featuring ex-members of Trouble), classic (having formed back in '77) metal act Manilla Road, stoner-rock trio Karma to Burn, heavy-psyche group Ancestors, San Antonio sludge-slingers Las Cruces, Seattle doom-shroomers Snail and ex-Monster Magnet guitarist Ed Mundell's Ultra Electric Mega Galactic. Lots of locals will be performing this time, unlike previous installments: Demon Lung, Dali's Llama, Albatross Overdrive, Megaton and Spiritual Shepherd. Look for more info and updates at Facebook.com/DoomInJune.